Hydrodynamic lubrication theory is a theory used to reduce friction and/or wear of rubbing solids with the aid of liquid lubricant. For a vast majority of the surfaces encountered in nature and used in industry, the source of friction is the imperfections of the surfaces. Even mirror shining surfaces are composed of hills and valleys – surface roughness. 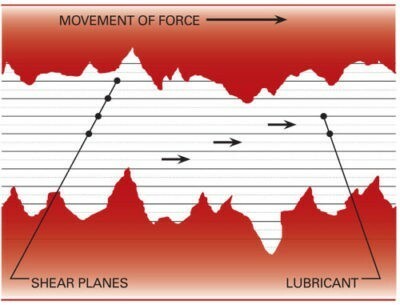 The goal of hydrodynamic lubrication is to add a proper lubricant, so that it penetrates into the contact zone between rubbing solids and creates a thin liquid film, as shown in the figure below. This film separates the surfaces from direct contact and it in general reduces friction and consequently wear (but not always), since friction within the lubricant is less than between the directly contacting solids. Lubricant is a substance which is used to control (more often to reduce) friction and wear of the surfaces in a contact of the bodies in relative motion. Depending on its nature, lubricants are also used to eliminate heat and wear debris, supply additives into the contact, transmit power, protect, seal. A lubricant can be in liquid (oil, water, etc. ), solid (graphite, graphene, molybdenum disulfide), gaseous (air) or even semisolid (grease) forms. 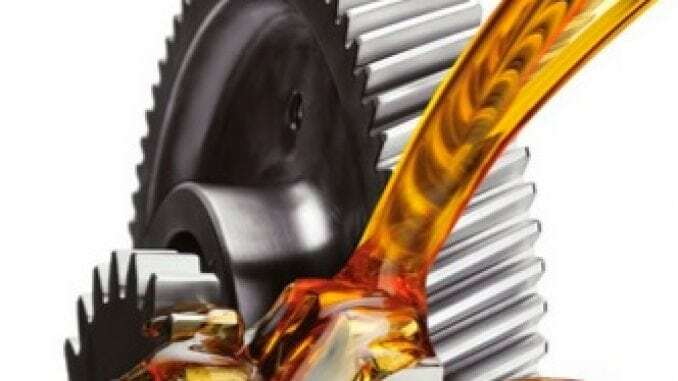 Most of the lubricants contain additives (5-30%) to improve their performance. Read further about the lubricant definition here. History of lubrication theory goes more than a century back to 1886 when O. Reynolds published famous equation of thin fluid film flow in the narrow gap between two solids (Reynolds 1886). This equation carries his name and forms a foundation of the lubrication theory. Derivation of Reynolds equation and possible solution methods are given here. It differs from elastohydrodynamic lubrication theory (EHL) due to negligible elastic deformation of the surfaces. Absence of the elastic deformations simplifies the problem as compared to EHL theory, but allows one to construct some important analytical solutions as will be shown further. First solutions of lubrication theory were obtained by Reynolds himself and can be found in the original work. One of the most important analytical solutions of the hydrodynamic theory (of the most interest in tribology field) was obtained by Martin in 1916. The solution considers a relative motion of cylinder on flat plane, as shown in figure below. This solution immediately shows the major relations within the hydrodynamic theory (but they also remain qualitatively true in elastohydrodynamic theory as well). The sliding speed has to be higher to generate a thicker film. The same is true for viscosity: higher viscosity leads to a thicker lubricant film. It should be noted, that it is typically desired to have a sufficiently thick lubricant film, so that the surface are completely separated to reduce wear. 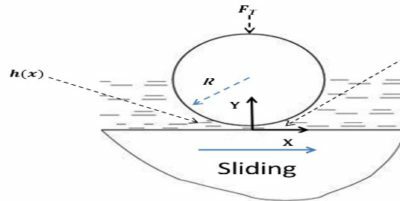 At the same time, it is clear, that the friction (hydrodynamic) will increase with the increase of both, sliding speed and viscosity. This in turn leads to energy losses. Therefore, there will be a trade-off between the wear performance and the optimization of energy losses. Currently, continuous efforts are undertaken to reduce the energy losses and to move towards a sustainable society and at the same time increase the reliability of tribological devices. According to the discussion above it is clear that there is a contradiction between the wear performance and the energetical performance. Therefore, classical lubrication theory has reached its fundamental limit in the energy losses reduction and new theories have to be developed. From that standpoint, solid lubricants, such as graphene or diamond like carbon are promising materials to reduce friction further.